In the last few years I have discovered spices I did not grow up on. My mum kept her food traditionally Croatian, she did try different things, but did not venture into the 'spice' world. I love cumin, I love it a lot. 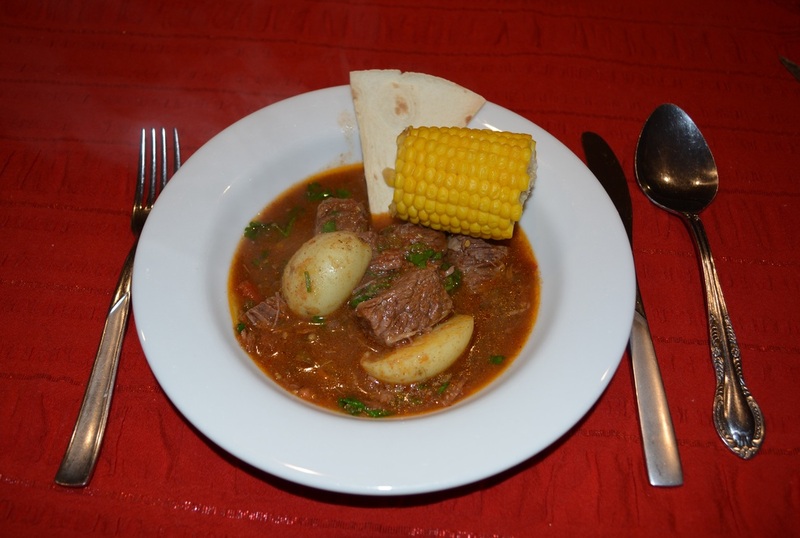 This is another dish my family loves, my kids called it a Mexican Goulash. This was really easy to prepare, I got to bake it in the oven, which means I can forget about it while getting on with other things I need to do. 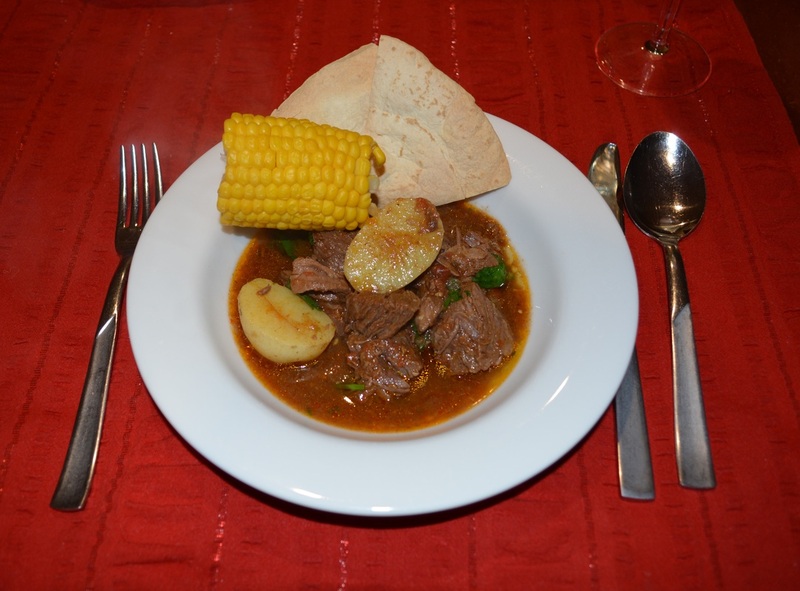 The meat was incredibly soft, the sauce delicious, the tortillas were a perfect side, the potato I mashed into the sauce in my plate which thickened the sauce, and we actually removed the corn from the cob and added it to the stew, and it worked beautifully. I cooked it in 2 stages, I put it to bake earlier in the day when I had time (as my kids had afternoon activities so I knew I couldn't do it all at once) then I turned off the oven and left it in the oven until I was ready to start the second stage. When I came home in the evening, I put it on the stove top, added the potatoes and tomatoes, then brought it back to the boil. While it was heating up I also turned on the oven to preheat it. Once the stew was boiling I popped it back in the oven and cooked as per recipe. Heat half of the oil in a large ovenproof baking dish (I like to use my cast iron pot), cook meat in batches, stirring, until browned all over. Heat remaining oil in the same dish, add the onion, garlic, cumin and chilli, cook, stirring, until the onion softens. (If the base of the pan looks like it is burning, add a small amount of water to the onions, it will release the stuck on bits, cook out the water, it evaporates quickly, and continue frying onions, until softened). Add the tomato paste, stir it through for 30 seconds, return the meat to the pot with the stock, vegeta, salt, pepper and just enough water to cover the meat. Bring to the boil, bake, covered, for 1 1/2 hours. Bring the pot back to the stove top over medium heat, add the potatoes and tomatoes, bring back to the boil, bake, covered, a further 35 minutes. Remove from the oven, uncover, cook over low-medium heat a further 20 minutes to thicken. Meanwhile, cut each tortilla into six wedges. Place in a single layer on a baking paper lined baking tray, toast, uncovered, in oven about 8 minutes or until crisp. Boil or grill the corn cobs. Once the stew is done, stir in the coriander just before serving. Serve with tortilla crisps and corn.